Due to their ideal chemical stability, high electric conductivity, and unique microstructure, carbon materials (CMs) have excellent application potentials in a range of fields. Conventionally, CMs were synthesized by the carbonization of low-vapor-pressure natural products or synthetic polymers. However, they have evident drawbacks, such as challenges in customizing the chemical compositions and microstructures of the obtained products, or complex and slow polymerization processes. To date, it is still highly difficult to devise a low-cost, facile, and highly controllable technique for large-scale production of CMs with desired structures and constituents. Recently, a research group headed by Professor Yu Shuhong and Professor Liang Haiwei from the University of Science and Technology of China (USTC) put forward a simple, versatile, and effective technique for synthesizing a series of functional CMs from small organic molecules (SOMs) using a transition metal-assisted carbonization process. This study titled “Transition metal-assisted carbonization of small organic molecules toward functional carbon materials” has been reported in the Science Advances journal on July 27, 2018 (Science Advances 2018, 4, eaat0788). Small organic molecules (SOMs) have some unique benefits as precursors for synthesizing CMs, such as comparatively low cost, common availability, and diverse element species with different contents. Earlier attempts in converting SOMs into CMs were nearly dependent on harsh synthesis conditions, for instance, chemical vapor deposition, pyrolysis in sealed reactors, or salt-melt-based ionothermal carbonization, owing to the high volatility of SOMs at evaluated temperatures. In order to overcome this, the research team headed by Professor Yu Shuhong and Professor Liang Haiwei developed a technique of transition metal-assisted carbonization of SOMs. The transition metals have the ability to catalyze the preferential formation of thermally stable intermediate polymeric structures and hence prevent the direct sublimation of SOMs at the time of the heating process, thereby assuring the successful synthesis of CMs with high carbon yield. 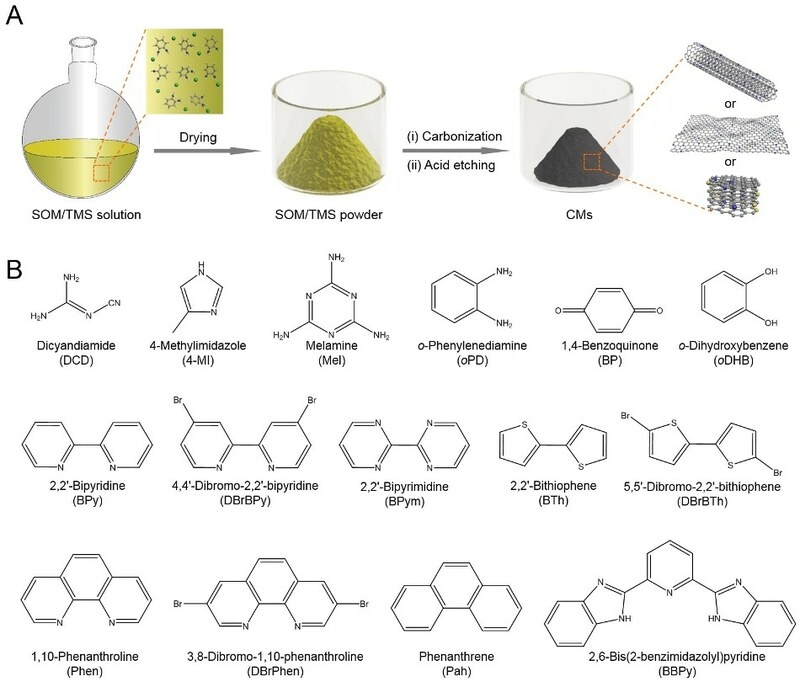 Scientists have discovered that in total, 9 TMSs and 15 SOMs can be respectively used as catalysts and carbon precursors for synthesizing CMs. Apart from that, two hard templates can be used in the technique to improve the porosity of the obtained CMs. The results of the research show that the technique is effective, simple, and versatile for the synthesis of CMs. The synthesized CM demonstrated three distinctive prominent microstructures (including micrometer-sized nanosheets, bamboo-like multi-walled carbon nanotube, and irregular particles) that were largely dependent on the molecular structures of the SOMs. Moreover, the CMs had large pore volumes, high specific surface areas, abundant heteroatoms, and also highly graphitic structures. Consequently, the CM exhibited exceptional application potentials for heterogeneous catalysis, for instance, hydrogenation of nitrobenzene, selective oxidization of ethylbenzene, and electrocatalysis, such as oxygen reduction reaction and hydrogen evolution reaction. This study opens the door for the production of CMs with desired structures and constituents. This study was supported by National Natural Science Foundation of China, Foundation for Innovative Research Groups of the National Natural Science Foundation of China, Key Research Program of Frontier Sciences, National Basic Research Program of China, Users with Excellence and Scientific Research Grant of Hefei Science Center of CAS, “the Recruitment Program of Global Experts,” National Postdoctoral Program for Innovative Talents, China Postdoctoral Science Foundation, Fundamental Research Funds for the Central Universities.